We’d love your help. Let us know what’s wrong with this preview of The Reluctant Heir by HelenKay Dimon. One person knows the truth that could ruin his family. And he’s just brought her home. Find Hanna Wilde. The order from Carter Jameson’s father will ensure Carter’s inheritance. Though reluctant to do the man’s bidding, Carter needs to see the girl he never forgot. But when Hanna returns to the estate where it all began, she wants answers as much as she wants Carter. And a One person knows the truth that could ruin his family. 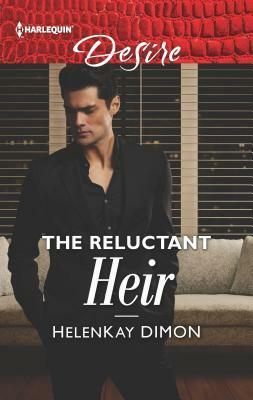 To ask other readers questions about The Reluctant Heir, please sign up. I have wanted to read Carter’s book since book 1. And I was not disappointed. I loved the enemies-to-lovers trope that was very well executed. The ongoing plot with their father developed into “I want to hit someone in the face with a chair” territory and some revelations completely took me by surprise. I was having my own out there speculations but they were defenitely exceeded by what was revealed. I really enjoyed this trilogy and am sad there are no plans beyond it. (*cough*NeedABookForJacks I have wanted to read Carter’s book since book 1. And I was not disappointed. I loved the enemies-to-lovers trope that was very well executed. The ongoing plot with their father developed into “I want to hit someone in the face with a chair” territory and some revelations completely took me by surprise. I was having my own out there speculations but they were defenitely exceeded by what was revealed. I adored Hanna and her strength and resilience with everything she went through. This is my second HelenKay Dimon story and I'm not disappointed. This is book three of the Jameson Heirs series, and I hope not the last. Carter Jameson is the youngest of the brothers. He's the charming guy who makes you laugh and lightens the mood. As it turns out it's an act, a façade, that he learned in order to get through his hellish childhood. When he drops the emotional wall you discover he's really a nice man. I found him endearing and my favorite of the brothers. He's a good romantic h This is my second HelenKay Dimon story and I'm not disappointed. This is book three of the Jameson Heirs series, and I hope not the last. Carter Jameson is the youngest of the brothers. He's the charming guy who makes you laugh and lightens the mood. As it turns out it's an act, a façade, that he learned in order to get through his hellish childhood. When he drops the emotional wall you discover he's really a nice man. I found him endearing and my favorite of the brothers. He's a good romantic hero, a little wounded, handsome and saveable. Hannah Wilde, our heroine, practially grew up on the Jameson estate. Her father was the groundskeeper and Hannah spent time at the estate during visits with Dad. With her father and sister now deceased she's left to grieve and wonder how much the Jameson's had to do with each of their deaths. She's afraid, intriqued, unhappy and also happy to see Carter on her doorstep. Her childhood crush comes rushing back and her attraction to Carter muddies her plans. Being a romance novel we know the ending will be a happily ever after but it's the how that's worth reading to the very end. I will admit that one of the secondary characters has caught my attention. We leave him in a personal disaster and I'm hoping he gets his on chance at happiness. This review has been hidden because it contains spoilers. To view it, click here. It was ok. Is this the last book -nothing was really resolved concerning the father. The big reveal was actually spoiled earlier in the book with Jackson calling their dad Dad even though he didn’t know. Wow if you’ve been following this series you will be surprised with Carters story.